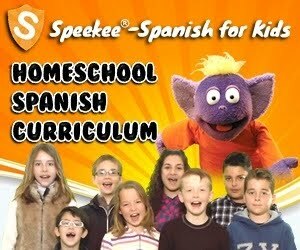 Just a quick shout-out to MommyMaestra sponsor, Speekee - Spanish for Kids! It's an online, video-based, Spanish immersion program for kids ages 4 and up. If you are looking for a different type of program to teach your children Spanish this coming homeschool year, and prefer one that doesn't require the parent to teach the lessons, this may be the choice for you. It does require internet access so that your child can login and watch the lessons at his or her own pace. Want to learn more? Read my complete review of their curriculum here.